Home HealthMental Health Love Actually! Yesterday, I ran a tough 15km! The Dwarka Marathon that attracted around 1700 runners is also famous for attracting the worst humidity that north of India has to offer. A brilliant opportunity to train towards building endurance! While I was helping the event organiser, Coach Ravinder Singh, I decided not to race the run, but do a slow 15km run of my weekend plan! And as always, every run has something to teach about life – The last one km threw an unforgettable, endearing and hope-lighting sight! This picture! I just had to stop and take a picture of these three! This guy, took care of their baby and waited at the point to take pictures of his wife running 10kms! 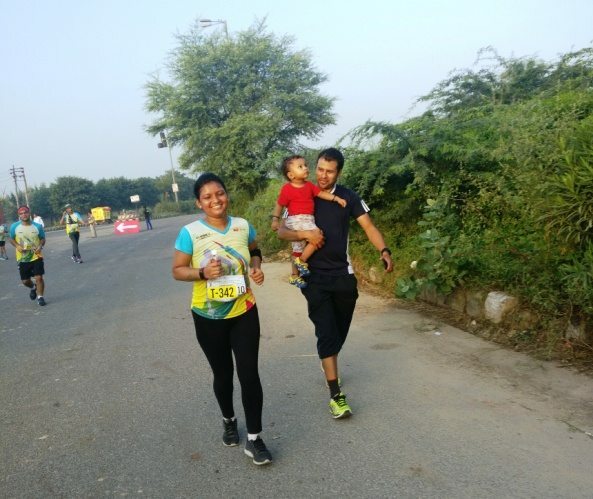 A woman running an event while her husband looked after the kid, cheered for her, waited at a point to take pictures – is still a luxury for a lot of women in India! Help her become a healthy and strong partner beaming with confidence! It’s not the thought that counts. The actual execution matters – showing up matters. The intent behind is not enough! So, don’t just pay for her gym membership – Give her the biggest gift – the gift of time – gift her an hour a day to go running, swimming, cycling, gyming, skipping, dancing, brisk-walking, learn karate, strength train, learn yoga or wherever lies her heart! At least an hour to feel good about looking after her body! Look after the kids during that one hour, or be by her side to cheer her up! Because all of the above is, Love Actually! Melba – Older. Stronger. Fitter! Hey.. a silent follower here. Just wanted to mention that u r one inspiration both ur workout n writing brings those small joys 🙂 Keep it up! This one bought a smile on my face.